Waterproof & submersible up to 25 ft. The SportDog YardTrainer 350 offers the simplicity of a basic training system and the versatility and ruggedness of a more advanced sporting dog trainer. With up to 300 yards of range, the compact SD-350 is more than adequate for basic training while also giving you the confidence to train your dog at a distance. 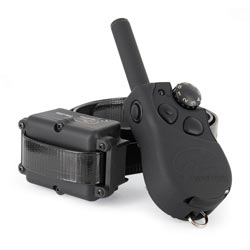 The transmitter allows instant correction-level adjustments – eight levels of both continuous and momentary static stimulation – while a tone feature allows constant communication. The SD-350 is a true all-weather system, with a completely waterproof transmitter and collar receiver that feature the exclusive SportDog DryTek technology. Long-life NiMH rechargeable batteries are convenient and provide up to 40 hours of use between charges, and a low battery indicator ensures you're never left with a dead e-collar or transmitter.